Front Row (L to R):- Brigid Anderson, Carers Association; Rose Dunne, Carer, Tullamore; Bernie Kennedy, Laois Offaly Carers; John Dunne, CEO, National Carers Association. Back Row (L to R): Caroline Poole, Carers Association; Angela Briggs, Carer, Tullamore; Ann Brickland, Carer, Tullamore; Mary Egan, Carer, Killeigh; Martin Bracken, Carer, Clara; Florrie McLoughlin, Carer, Ballycumber; Declan Dunne, Carer, Cappincur; Mary Hughes, Carer, Kilbeggan and Catherine Cox, Carers Association. 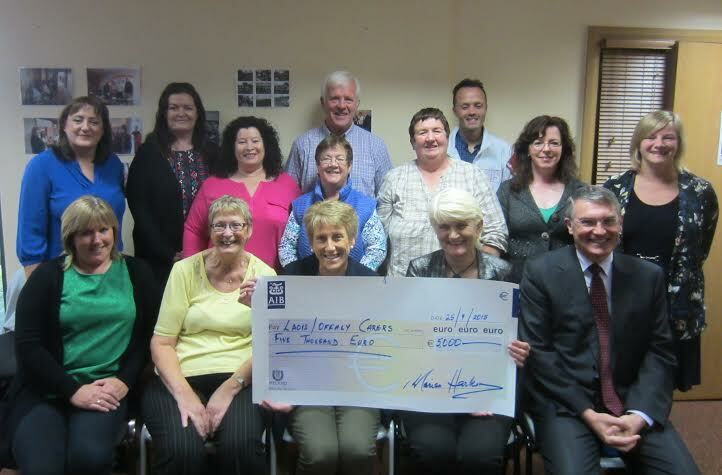 Independent MEP Marian Harkin presented a cheque for €5,000 to Laois Offaly Carers in Tullamore on Friday, September 25th. The cheque is one of a series of such presentations she is making to Carers Groups in her constituency, drawn from the pension payments she receives as a former TD. Prior to this, she had returned her pension to the State.